Functional Morphology To determine the degree to which the musculoskeletal system is tuned for optimal performance, one has to consider the underlying structure. The capabilities of a muscle depend strongly on its cellular architecture, and we have found that the architecture of muscles tends to reflect their function. Continuing work is aimed at understanding how systemic demands and changes in systemic demands influences skeletal muscle structure and performance. Motor Control Perhaps the most important aspect of performance is the control system, but the control system is not independent of the musculoskeletal anatomy. The lowest level of neuromotor integration, the spinal stretch reflexes, appear to integrate information about the structural organization of the limb. Ongoing work uses a mathematical model of the hindlimb to develop hypotheses about the role of length and force feedback. Mechanotransduction Our greatest effort is to understand how the mechanical demands on muscle are converted into the biochemical signals required to control the cellular architecture. We are particularly interested in signal transduction mechanisms associated with deformation of the cell membrane. 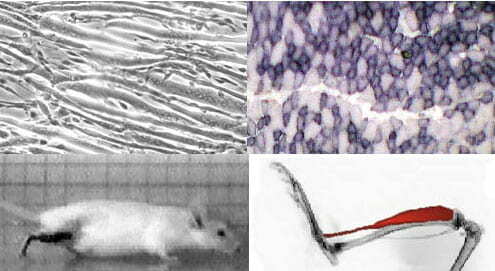 Skeletal muscle membranes contain caveolae, which deform during stretch and may act as mechanical triggers for stretch induced signaling. Naidu, SH; Cuckler, JM; Burkholder, T; Ducheyne, P. Initial stability of a modular, uncemented, porous-coated femoral stem: a mechanical study. American Journal of Orthopedics (1996) 25(12):829-834.